Clean tracks completely and quickly with this specially designed car. Unit applies and wipes solvents (sold separately) in one pass, or can be used as an abrasive type cleaner. 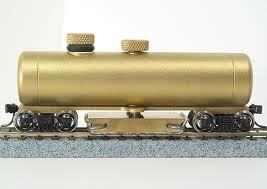 Solid brass construction (except for trucks) resists most solvents. Unit weighs about one pound for maximum contact and deep-cleaning action. Special drag pads wont catch on trackwork and are easily changed when dirty. Unit comes assembled with body-mount Kadee couplers and complete instructions.